Migraine is a prevalent disease with a substantial socioeconomic impact. However, stigma affects social attitude toward migraine, accruing additional burden on individuals with migraine and isolating them from a society that should be supporting them. This review will discuss the following concepts: (1) the emergence of stigma toward migraine and its impact on medical care; (2) internalized stigma among those with migraine and its detrimental effect on quality of life and patient-physician relationships; (3) the structural impact of stigma on research funding, workplace support, and specialized care; and (4) strategies for “rebranding” the disease and alleviating stigma toward migraine. 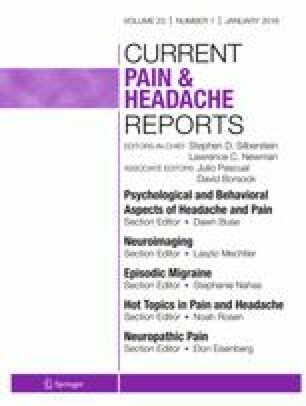 Recent literature on condition rebranding offers strategies on how to define and communicate migraine to the public. Rebranding of migraine to alleviate societal stigma is paramount. This involves use of unified language, education, and advocacy. Simy K. Parikh and William B. Young declare no conflict of interest. Foxhall K. Migraines were taken more seriously in medieval times: where did we go wrong? [Internet]. Available from: theconversation.com/migraines-were-taken-more-seriously-in-medieval-times-where-did-we-go-wrong-64497 [Accessed 26 Apr 2018]. Employees hide headaches, migraines from supervisors. [Internet]. Available from: https://www.reuters.com/brandfeatures/excedrin/employees-hide-headaches-migraines-from-supervisors Accessed 25 Apr 2018. UCNS Diplomates Certified in Headache Medicine. [Internet]. Available from: https://www.ucns.org/globals/axon/assets/12644.pdf Accessed 26 Apr 2018.